LED advanced light MR 16 is the long life, energy efficient solution to commercial, retail and residential lighting fixtures with the GU 5.3 base. It requires just 6.0 watts to match the light output of conventional 40 watt MR bulbs, resulting in significant energy savings over traditional light bulbs. 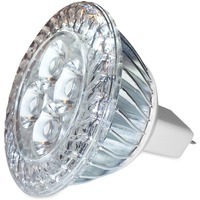 With proprietary CrimpFin Heatsink design, this light lasts up to 50,000 hours. Design also includes 415 lumens, 2700K color, 25 degree beam and no UV or IR radiation.